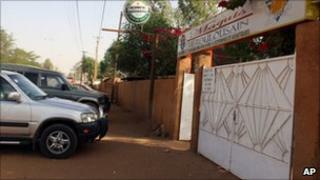 France has confirmed that two of its citizens who were kidnapped from a restaurant in Niamey, the capital of Niger, on Friday have been killed. French Defence Minister Alain Juppe said they died during an attempted rescue operation by Niger's national guard near the border with Mali. President Nicolas Sarkozy condemned the killings as "cowardly and barbaric". No group has said it was behind the abduction, but al-Qaeda's North African offshoot has seized Westerners before. "With the operation launched and coordinated with French elements in the region, the terrorists were intercepted at the Mali border and several of them were neutralised," Mr Juppe said. "After the fighting, the two hostages were found dead." A Niger government source told Reuters news agency that the bodies of the two hostages had been flown back to Niamey. Search operations were launched after witnesses said men wearing turbans entered a restaurant in Niamey and took the men away in a car. Government spokesman Laouali Dah Dah said the kidnappers spoke Arabic, French and Hausa, but that their identity could not be confirmed as they had their faces covered. One of the kidnapped men was reportedly an aid worker due to be married to a woman from Niger, and the other man was his friend. Later on Friday evening, Niger's security forces exchanged fire with the gunmen near Ouallam, not far from Mali. Mr Dan Dah said security forces had "intercepted the kidnappers a few kilometres north of Ouallam and there were exchanges of fire". But the clash ended with the kidnappers escaping after the troops withdrew out of fear of wounding the hostages.